Travel back in time with the always classic clawfoot tub. Valley Acrylic's Victoria clawfoot tub brings back this classic bathing tradition in a big way with all the amenities of a modern bathroom while staying true to an authentic bathing experience. Pair with your choice of freestanding faucet to complete your look. Step into the Aston WT623 55 in. x 30 in. Jetted Walk-in Tub with ease and enjoy a strategically engineered, soaking experience. The barrier free entry with low-threshold door will ensure a safe entrance and exit to your bathing experience. This model will be a perfect addition by adding beauty and style to any bathroom. The stainless steel door adds the perfect touch of modern to any style. With numerous safety features including a hand bar, chair-height seating and moulded-in floor pattern, you will be assured comfort. The faucet and door handle on this model provide easy leverage to the user each time. This unit is the perfect solution for the addition of a walk-in tub. Slip into the luxurious, acrylic, fibreglass-reinforced, Aston BT686 67 in. x 28 in. Acrylic Claw Foot Slipper Tub and relax. Add sophistication and simplicity with this classic model updated for today's standards. 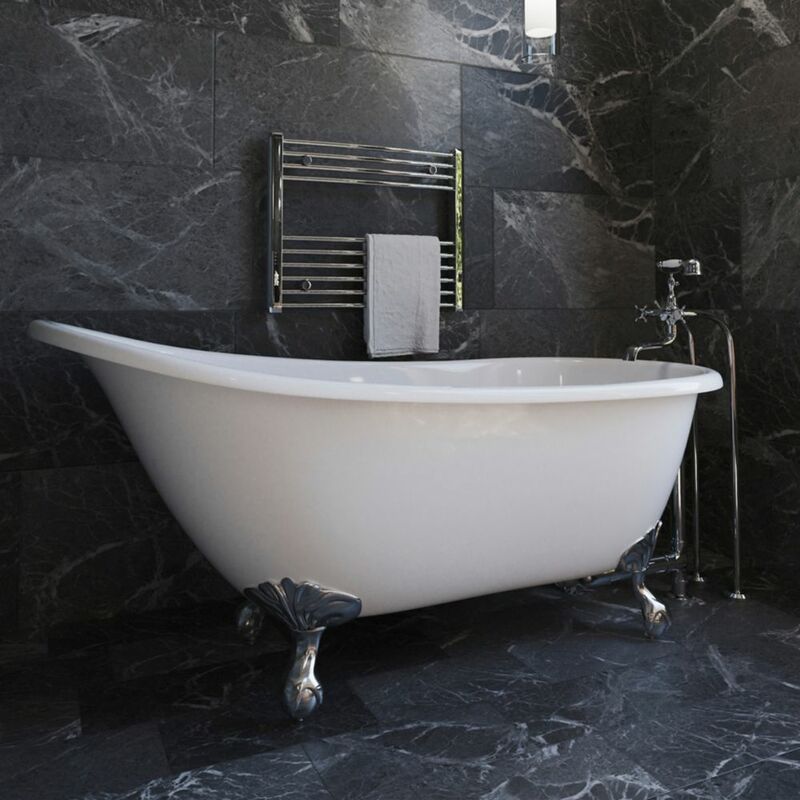 This tub is styled after the original cast iron design, but allows for easy manoeuvreability within your bathroom and includes a gorgeous functional Victorian-style tub faucet to complete the look. ANDRINA FREE STANDING BATH - FSW105 bath in high gloss white only, Dimension: 69" x 29 1/2" x 27 1/2", Azure solid surface freestanding collection is manufactured with both natural stone and manmade materials, Ingredients are mixed to provide an ultra-smooth, high gloss, non-porous, sold and durable surface, Scratch, stain and fade resistant, Includes levelling feet, Includes an integral "push up" drain in high gloss white and a slot designed polished chrome overflow. REFER TO INSTALLATION INSTRUCTIONS SUPPLIED FOR additionalL INFORMATION. Victoria Freestanding Clawfoot Non Whirlpool Bathtub in White with Chrome Legs Travel back in time with the always classic clawfoot tub. Valley Acrylic's Victoria clawfoot tub brings back this classic bathing tradition in a big way with all the amenities of a modern bathroom while staying true to an authentic bathing experience. Pair with your choice of freestanding faucet to complete your look.